Mary, You made those super market flowers look like they came from an expensive Florist! Just beautiful! Mary, your flowers are gorgeous! Flowers always add some cheer! Beautiful mosaic, have a wonderful week! Pink is one of my favorite colors and your mosaic with the pink flowers, just lovely. Thank goodness for supermarket flowers in January. I picked up jonquils for a friend there yesterday. After a long absence I'm so happy to be joining Mosaic Monday once again! I'm loving supermarket flowers too, especially the inexpensive tea roses. Less than $4 a bunch! You can't beat that price, and they've lasted really well too. Somehow we will make it to Spring, Mary, with a little comfort from our flowers. Lovely flowers in a beautiful vase (I read your post about your love of white after the holidays - so fitting with the pale pinks). I must buy some flowers too! How refreshing it is to see this beautiful pink! 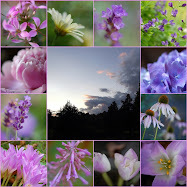 Truly gorgeous shades of pink, love your photos! It is wonderful that we can get lovely flowers like these in the winter to brighten our days! Yours are gorgeous! Thanks for hosting! Have a great week! I wish our supermarket carried flowers like these!! The pink is a welcome sight! I have been playing with pink this weekend also. This time of year always seems a little drab-ish to me. Basically from here until spring because we always have so many gray skies and dark days. I never think to pick up some flowers from the store - I should try it! Flowers are so cheerful in the middle of winter! Beautiful! 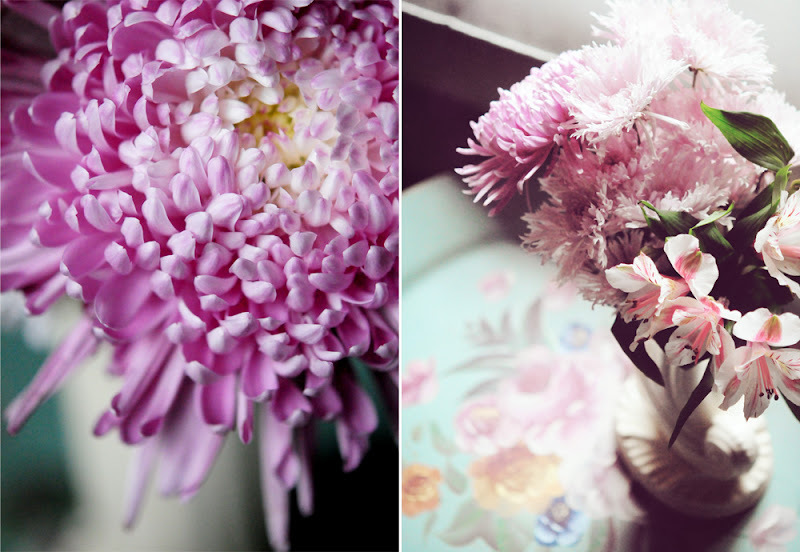 I love flowers in the home. Right, we all need some flowers! Your images of flowers in pink are so lovely. Pink is my colour today also, but a knitted hat instead of flowers. Lovely photos as always, Mary! Hope the sun shines for you this week! It looks like you found a beautiful bunch! Nothing like beautiful fragranced flowers to lighten up a room. I love the place you have chosen to sit them. I'll take pink any time of the year. As always, your images are gorgeous! Thanks for continuing to host MM so faithfully each week! Your flowers are lovely, and your photographs are cropped so perfectly to create the perfect mosaic. A little colour is great for the January doldrums. Your pink flowers are just the ticket. Wonderful flowers and lovely music. Great ! Breathtaking! I love that music too... Thank you for hosting this great party. Absolutely, Mary! And once again you've captured them beautifully! 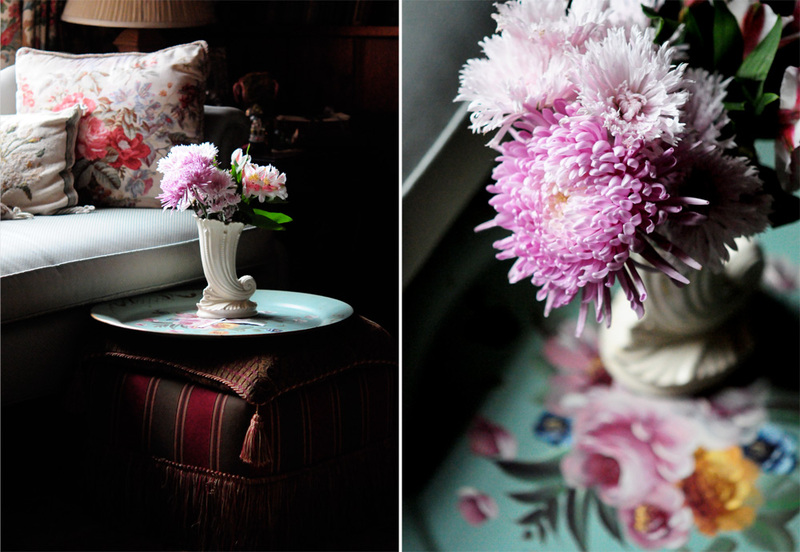 I think pink flowers at this time of year is exactly what is needed! Yup! It is time for flowers from the market and I just got a gorgeous bouquet of plum roses for .99 cents! I needed the cheering... and don't they work sweetly? Mary, Love all the Pink! It reminds me that Valentines is just around the corner and I'd better get busy and put all those shades of pink satin into the store! Thanks so much for hosting! I feel God led me to you today in my deep sorrow and despair.....thank you for the beauty in your blog....your soul must radiate. We are never alone (Seek and ye shall find). Thank you for renewed faith. Beautiful pinks. If I were wealthy I would have lots of fresh flowers in the house all winter! Mary AND ALL BLOG READERS - I'M REALLY SORRY THAT I DIDN'T CHECK MY BLOG ADDRESS WHEN I SUBMITTED MY LINK LAST WEEK SO THE PLACE YOU'RE TAKEN TO IF YOU CLICK ON ME IS NOT MY BLOG! I'll check my spelling from now on - that's for sure!